2017 is Canada’s Sesquicentennial. In this significant year in the country’s life, the ‘Program Committee’ is inviting, throughout the year, a number of speakers who will address the club to inform us on matters relating to some of Canada’s significant contributions to the world. Following this theme, the first meeting of the year, normally dedicated to a time of inspiration, will inform the members of the work of ‘L’Arche’, an international organization founded by John Vanier, the son of a former Governor of Canada, Georges Vanier. Our Speaker, Sue Mosteller, is a Sister of St. Joseph of Toronto. Since 1971 she has been a member of the L'Arche Daybreak Community for those with developmental difficulties. She asked to be assigned to live and work with the community after hearing John Vanier speak at the University of St. Michael's College and participating in a pilgrimage to Lourdes. She described the way he spoke about people with disabilities as a turning point in her life. In 1976 she became L'Arche Daybreak's second Executive Director. She lived with the L'Arche Daybreak community for 40 years. Beyond living as a member of the Daybreak community, she held a leadership role within the wider L'Arche organization. 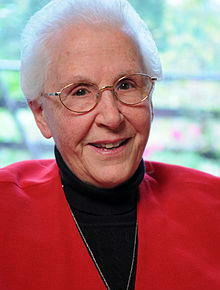 She was the first person elected to hold the role of International Coordinator after Jean Vanier. Holding the position for nine years, Mosteller traveled extensively, assisting with the birth of new L'Arche communities in multiple countries. During her time in this position the L'Arche network expanded from 30 to 65 global communities. Mosteller works as a Trustee for the Henri Nouwen Legacy and continues to be a member of L'Arche Daybreak. Additionally, Mosteller lectures and gives retreats around the world. She currently lives in Toronto, Canada. On November 5, 2011, Mosteller received an Honorary Doctorate from Tyndale University College and Seminary in Toronto in recognition of her "lifelong commitment to sharing the love of God with many of society's marginalized people".